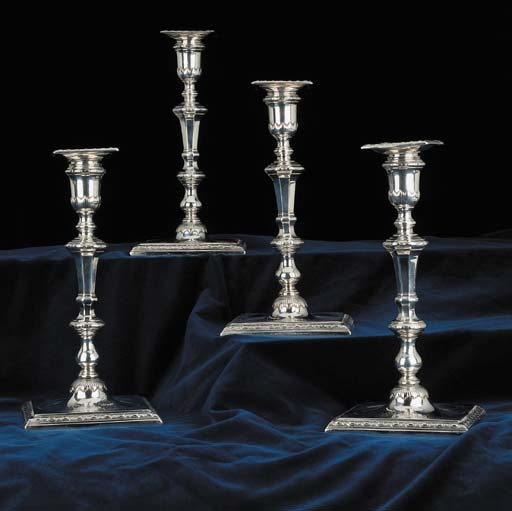 Each on square base with guilloche band, rising to a knopped baluster stem with similar bands and surmounted by an vase-shaped socket with band of leaves, the square nozzles with guilloche band, one side of base engraved with a coat-of-arms in rococo cartouche, one side of nozzle engraved with a crest, marked under bases, on sockets and nozzles, also with inventory numbers and scratchweights: 'No. 1 33=12, No. 2 34=4, No. 3 32=4, No. 4 32=12'.